A few months ago, Suzanne Verma changed an eight year-old boy’s life. Born with a rare condition called Microtia, the external part of his ear had been malformed since childbirth. So, she gave him a new one. 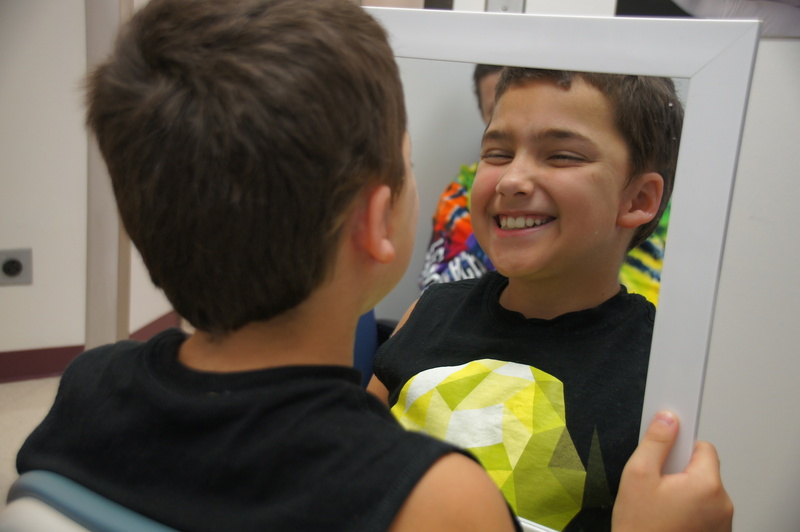 One of Suzanne Verma's young patients receives his new prosthetic ear, just in time for a new school year. Verma (biological and pre-medical illustration, ’99) is an anaplastologist in the Center for Maxillofacial Prosthodontics at Texas A&M College of Dentistry. She works with patients who were born with a missing or malformed body part, or perhaps lost a nose to cancer, or their eye in an accident. She combines science and art to recreate malformed or absent parts of the human body through artificial means, specifically in facial prosthetics. Using new and amazing technology, the prosthetics she creates not only replace a missing part, but help ease patients’ anxiety when they shop, go to school or ride public transportation. “This job is extremely humbling. In addition to helping a patient ‘feel normal’ again by giving them back an external part of their body, you are helping them heal internally,” she said. Suzanne Verma (BPMI, '99) consults with a new patient. Verma was still in high school when she decided to pursue this line of work. She had read a TIME magazine article about an anaplastologist who created an artificial eye for a patient, and it more than piqued her curiosity. It changed her life. It was a profession she did not know existed. Eager to learn more, she called the reporter, who gave her the contact information for the doctor featured in the story, who was more than willing to talk with Verma and give her helpful advice. Her first order of business: find a college. Those big universities were referring to ISU’s Biological and Pre-Medical Illustration Program (BPMI), a rigorous niche program for undergraduate students who are interested in pursuing a career in art and medicine. Shared by LAS and the College of Design, ISU’s BPMI program is one of the longest-running undergraduate programs of its kind. Fewer than a dozen such programs or opportunities exist in the U.S.
Verma kept in touch with the anaplastologist in the article for many years, during which she went to graduate school at the University of Illinois Chicago and then worked in the United Kingdom and Canada before settling down in Dallas at Texas A&M’s College of Dentistry in 2003. When a patient needs a prosthesis, the process is a bit like building a house. From pouring the foundation to putting the final touches on the décor, no detail is overlooked. The prosthesis, made of silicon, is designed to be removed each night by the patient, so all the mechanics must be in order. A patient holds his new facial prosthesis. Verma and her team begin by using CT scans to precisely plan the implant location for the patient. Using advanced technology described as “GPS in the OR,” the surgeon uses an instrument outfitted with LEDs to show Verma and the team their exact location in the CT scan, in real time. “With this remarkable technology, the surgeons can place implants precisely according to the preoperative plan,” Verma said. A patient typically waits four to six months for the implants to fully integrate with the bone. During that time, Verma uses data from the CT scan to create and 3D print a physical model of the missing part, such as an ear. She makes a duplicate in wax and uses fine art and science to sculpt the wax to the patient, a skill she credits to Iowa State. 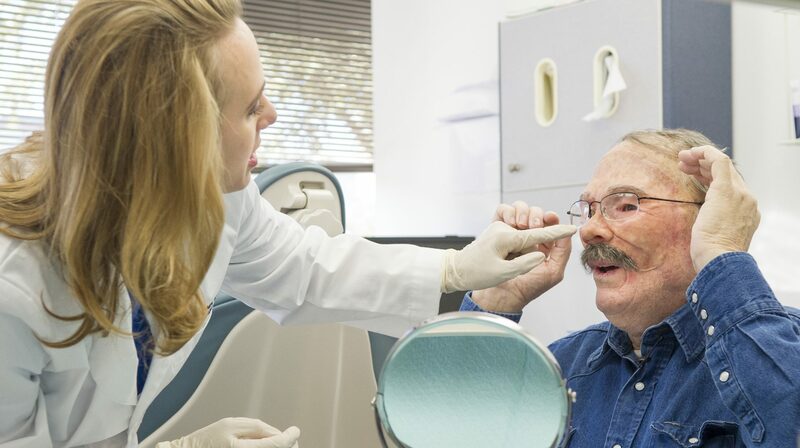 The patient offers real-time feedback until Verma has created exactly what they want. Then, she creates a silicon mold. The patient returns so she can match the color of the silicon prosthesis to the exact color of their skin. Verma makes adjustments to a full-face prosthesis. Once the silicon is painted, the finished prosthesis is fitted to the patient. The whole process is spread over about five appointments, and by the final fitting, Verma has become an integral part of the patient’s life. Verma is also an assistant professor in the Oral and Maxillofacial Surgery Department. She teaches graduate courses and lectures to post doctorate oral surgery residents and dental students. Some of her research focuses on advanced applications of surgical navigational systems in craniofacial implant placement. She also studies the effects of UV light on facial prosthetics. 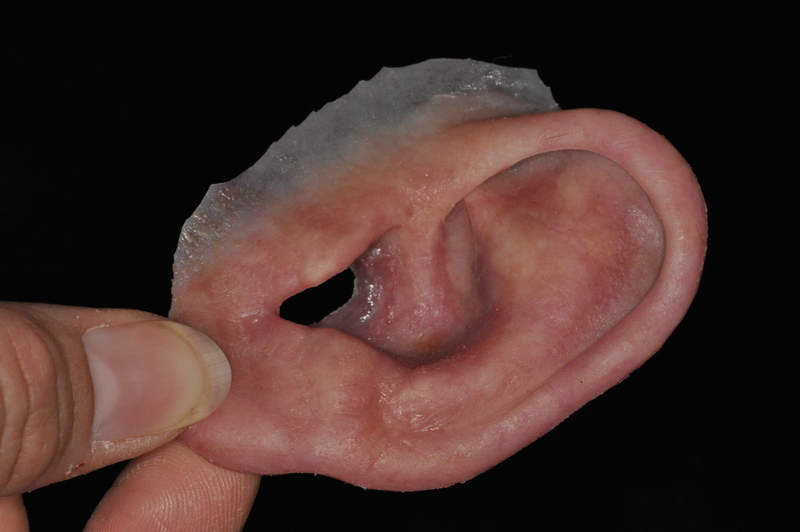 A detailed shot of a silicone ear prosthetic created by Verma and her team. This research illustrates Verma’s strengths in science and art, strengths she credits to Iowa State. In addition to studying the advanced science and technology behind creating a prosthesis, she also sharpened her artistic ability during a semester-long fine arts program in Rome. Today, Verma continues to test her ability to inspire. She is an active member of several associations related to her field, including the director on the Board for the World Coalition of Anaplastology and the president of the International Anaplastology Association. Verma pigments clear silicone to match all the various colors found in a patient’s anatomy. The silicone will be painted intrinsically in layers into the mold of the sculpted orbital prosthesis. Anaplastology is a small field, where those practicing around the world are connected through mutual interests to improve the lives of their patients. It is a career that requires deep knowledge in science and art – a combination most people cannot fuse. For those students who do have a passion for both, Verma said she would love to speak with them or connect them with someone in their area. Suzanne Hutchinson Verma received ISU’s Outstanding Young Alumni Award in 2015. 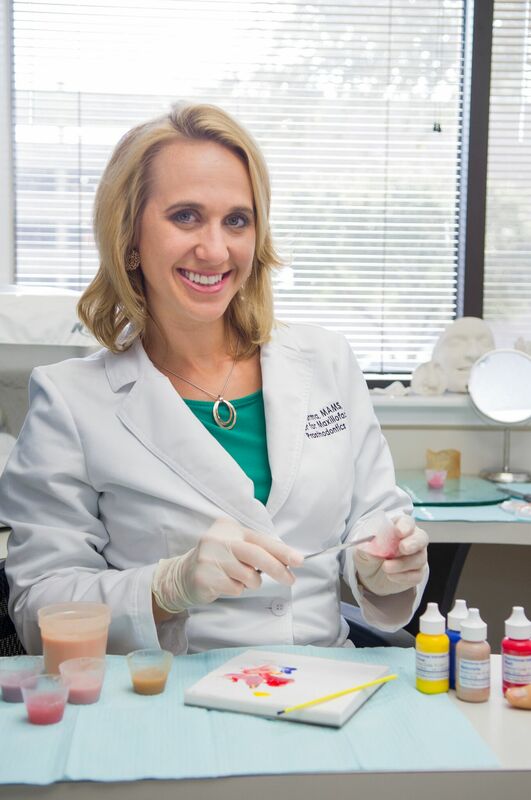 She lectures nationally and internationally on the use of technological advancements in craniofacial reconstruction, and is a passionate educator in the medical and dental communities. When in Scotland . . .